It's a Party on the Boat on "Buzzin," produced by Murda Beatz. Young Niagara producer Murda Beatz just hit OVO Sound Radio with a historic mix, packed with almost too much new music to keep track of. There was new Migos, "Show'll Is," as well as a new solo track from Quavo, who showed up a bunch of times on tonight's episode. A Murda-produced collab between Quavo and PartyNextDoor had been revealed in March, and that song, "Cuffed Up," was a highlight of the show tonight. The most unexpected collab that Murda let loose was one between PND and another melodic ATLien, Lil Yachty. On "Buzzin," Yachty's tender auto-tuning and Party's spontaneous harmonizing are a potent late-night concoction. 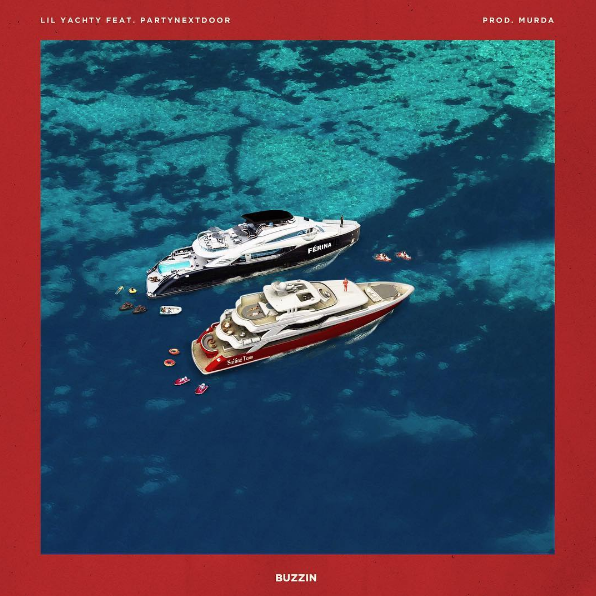 It turns out that the track is Yachty's latest single, which arrives less than two weeks after his Summer Songs 2 mixtape. Check out the fantastic "Buzzin" cover art up top.